Blog postings about our program to support the identification, rescue and conservation of our Nations WW1 Memorials. execute the project, can that in-kind donation count as part of the match for the program? Since it is not specified in the competition manual, we met with the program executive committee and got a ruling on this one, . Here is the answer. 1. The rate or cost of the in-kind donation is at a standard, commercial and competitive rate they would charge for that service if it were paid for. 2. The company provides a letter declaring the service and it's commercial value. 3. They provide an invoice for the service with a line item of the donation that zeroes it out. It would however exclude volunteer labor.. IE if a group of legionnaires come out and help you do gardening, you can't just throw a value on that and submit it to the match. I just ran into this site by a bit of happenstance. Any chance the Commission might accept late submissions. Our city's Eagle Memorial is in dire need of rehabilitation. Thanks! The submission period for grant applications is open until June 15, 2017 and the project needs to be scheduled for completion by November 11, 2018 - so I think you should be in good shape. A great way to get the ball rolling is to contact your local American Legion post, VFW post and Daughters of the American Revolution chapter. These folks will likely have been involved with the original establishment of the memorial. The American Legion and the VFW are also both supporting members of the program - They can be powerful allies and partners in getting these service projects happening. Our Central School District is working on a monument project involving a bronze tablet that was cast in 1919 with the names of men who died in service from the central towns in our county. The tablet was mounted on the front wall of the county courthouse and remained there until the local American Legion post relocated, to which they took the tablet with them. Over the last 100 years, the tablet has had many homes but due to recent arrangements was in storage. Students with the school are attempting to raise money and awareness to establish a local monument for WWI veterans using that tablet. As far as I know, as county historian, we have no memorial dedicated solely to WWI veterans. Would this project be eligible for a grant? YES, provided that the project is slated to be completed prior to 11/11/2018. Teaching the next generation about that. I am not on the jury so I have no sway - however, I just want to say: Thank you! Additionally, if you get a preliminary grant application done and submitted , we can promote the project on the US WW1 Commission's website, giving your project visibility, credibility and some sway with local funding sources. You can updated your submission after all the way until the submission deadline on June 15th, 2017. We will post more questions as they come up in these final months before the grant application deadline on June 15, 2017. Thank you all for your interest and incredible dedication in getting these wonderful projects going! This is Part 2 of Laura A. Macaluso's three part series profiling a Doughboy Memorial project in Connecticut. Again we want to thank Laura for her knowledge and insight, which she is sharing for all our benefit. In this post, you can learn a great deal about how these types of memorials come about in the first place, and some of the process a sculpture goes through in creating an iconic statue. Reading over preparatory materials for the SOS! grant application from fifteen years ago, it's clear that the basics of the monument's creation and installation was known but little more than that. Several things happened in the following years that enlarged the backstory of the Timothy Ahearn Memorial in important ways, connecting information in state archives, local libraries and personal collections. In the years that the City of New Haven and the Elm City Parks Conservancy were addressing the conservation needs of bronze monuments in the park system (2001-2007), Amy Trout, the curator at the New Haven Museum, was putting together an exhibit on the Federal Art Project of the Works Progress Administration (WPA). The exhibit provided the context for the large amount of public works of art created in New Haven under the WPA in the 1930s—including the Timothy Ahearn Memorial, the only bronze monument to come out of the WPA in the city or county. The project was something like the 100 Cities/100 Memorials “Memorial Hunters Club” in that I traveled around the city to search out the remaining WPA works of art. Timothy Ahearn Memorial, Karl Lang, West River Memorial Park, 1937. Photograph by Henry Skrecko. Courtesy of the Connecticut State Library. Clay model of the Timothy Ahearn Memorial with artist Karl Lang working in his studio in Noroton (Darien), Connecticut, 1937. Courtesy of the Connecticut State Library. But, even with this very detailed inscription (which is reflective of the documentary nature of the WPA and not common to most non-WPA monuments and memorials), at the time, most of this information went over my head. As the curatorial assistant on the exhibit project, I was more interested in the artist and the memorial as a work of art. The names listed meant little and World War I so far away in my consciousness that I wrote in the SOS! application that Ahearn "left for active duty in Germany" (not quite!). The choice of Ahearn, a member of Company C of the 102nd Regiment of the 26th "Yankee Division"—and what the regiment meant to New Haven's history and identity—was also obscure, at least to me, a student of art history, not of military history. Despite my shortcomings, both the monument's conservation and the exhibit were a success. 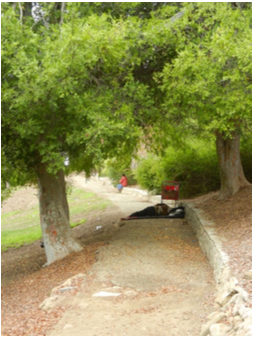 As noted in the first blog post, the positive attention regarding the conservation treatment of the memorial encouraged the Parks Department's continuation of conservation treatments for monuments across city parks. This was matched by the success of the exhibit, which caught the eye of State Representative David McCluskey who sponsored a bill in the legislature to fund a state-wide survey of WPA artworks still in existence. Although the bill was not funded, $150,000 was appropriated by the General Assembly for an inventory to be conducted by the Connecticut State Library, which contains the largest body of documentary material about the WPA in the state. Clay maquette of the Timothy Ahearn Memorial, Karl Lang, 1937. Photography by Alfred C. Shaw. Courtesy of the Connecticut State Library. In viewing these photographs, you can trace the process that Lang, a traditionally trained artist who worked on the sculpture of the doughboy from the inside out, followed. First, Lang shaped a small maquette out of clay. It is likely that committee members met with Lang to view the small study and give approval and/or suggest changes (you can see that the original maquette featured drawings incised into the sides of the base, but this was later changed to three sides of inscriptions, which told Ahearn's story with words instead of pictures). Clay model of the Timothy Ahearn Memorial in Karl Lang’s studio in Darien, Connecticut, circa 1936—1937. Courtesy of the Connecticut State Library. Lang then crafted a large figure of a male body in clay around an armature, delineating the musculature . The figure was then built up by placing historically correct clothing to create a Great War infantry soldier: "puttees" (wrappings) around his lower legs, a wool blouse (coat), and the metal "Brodie" helmet that often appears tilted on the heads of World War I soldiers at the front. (Image 2.6) This kind of visual documentation is not often found in the study of monuments and memorials and offers a rare view into the working methods of monument makers, a process that humans have been engaged in since Antiquity. The last part of the Ahearn Memorial backstory just came to light in 2016—a decade after my initial work—due in part to the upcoming centennial of the American entry into World War I (April 2017) and the centennial of the Armistice (November 2018).As described, I had little connection to the names listed on the plaque attached to the Ahearn Memorial beyond the two names associated to the WPA (John Murphy, mayor and the primary supporter of the WPA in New Haven and Wayland Williams, the city and state WPA administrator), but, after preparing the book, New Haven in World War I, whose publication will coincide with the centennial of the American entry into the first global war of the twentieth century, it became clear that the backstory of the monument was missing something at its core: a focus on New Haven's infantry soldiers and veterans, whose memories of World War I were replayed every year around the Timothy Ahearn Memorial, and around the history of April 20, 1918—the battle of Seicheprey, where seventeen New Haveners died together on the western front—an event little remembered today. Laura A. Macaluso, Ph.D., holds degrees in art history and the humanities from Southern Connecticut State University, Syracuse University in Italy and Salve Regina University. She has worked as a grants writer and curator in historic sites, museums, art, and park organizations. She held a Fulbright at the Swaziland National Museum in 2008-2009, and returned in 2010 under an Ambassador's Fund for Cultural Preservation award from the State Department. She curated the exhibit "An Artist at War: Deane Keller, New Haven's Monuments Man" and authored the accompanying article in Connecticut Explored magazine (Volume 13, No. 1, Winter, 2014/2015). Laura is the author of Historic Treasures of New Haven: Celebrating 375 Years of the Elm City (The History Press, 2013) and Art of the Amistad and the Portrait of Cinqué (American Association of State and Local History/Rowman & Littlefield, 2016). Her forthcoming book, New Haven in World War I, was endorsed by the United States World War One Centennial Commission (www.worldwarIcentennial.org). The book will be accompanied by an article in the spring 2017 issue of Connecticut Explored. In addition, she has written articles, blog posts, and book reviews for Material Culture, The International Society for Landscape, Place, and Material Culture; Nineteenth Century; AASLH; National Council on Public History; Collections, A Journal for Museum and Archives Professionals, and Adventures in Preservation. She lives with her husband Jeffrey Nichols, the President/CEO of Thomas Jefferson's Poplar Forest, in Lynchburg, Virginia. ​As we posted previously, the Ogden Utah Doughboy Statue renovation submitted its grant application a few weeks ago. The Doughboy memorial was originally located at the local American Legion post, but was donated to the City of Ogden in the 50's. It is now re-located in the Veterans Section of the Ogden City Cemetery. The Ogden Doughboy was created by renowned sculptor Gilbert P. Risvold, who also sculpted a series of Doughboy statues in Illinois. You'll enjoy the part of Terry's interview where he tells us about when, at some time in the past nearly 100 years, the statue's helmet was lost or stolen. It was replaced - by well meaning but perhaps misguided folks - with a construction worker's helmet, and then spray painted, as was the whole statue, with gold radiator paint. Conservators around the country are quacking in their boots! Of course, Terry and his team are doing it the the right way. We invite you to follow Laura Macaluso's post series on this blog for some guidance on how to avoid such well intentioned errors. Thanks again to Terry Schow, the American Legion and all the veterans organizations that are supporting the 100 Cities / 100 Memorials program. Your support makes the rescue of these ailing WWI memorials possible. Bless you and Happy New Year! The video is also available in the RESOURCES > Project Profile tab on the 100C / 100M web site. Please note that although this is a matching grant competition, based on our program rules, once you have submitted your grant application, we are able to help you promote it in a variety of ways including via the US World War One Centennial Commission website, posted project profiles, blog posts, social media posts, and our outreach communications vehicles. This can help you highlight your project in your communities and with local media, which in turn assists you with your fund raising and support expansion. Even if your project application still needs work, we can promote it as soon as you submit it. Then, on request, we can set it up so that you can edit and update your submission documents and information up to the submission closing date of the competition on June 15, 2017. Terry Schow from the American Legion has put together an Ogden, Utah matching grant application that was officially submitted last week - We congratulate him and his associates and would like to share their project with the rest of the 100 Cities / 100 Memorials participant community. Every one of these projects is amazing in it's own right. This one distinguishing itself by the impressive coalition of organizations that have pulled together for the project. The project originated with the Weber County Heritage Foundation, who began a multi-phase conservation program for the neglected memorial several years ago. The completion phase for the project is scheduled in time for the centennial of Armistice Day, November 11, 2018. Terry and team then pulled together the Weber County Heritage Foundation, the Golden Spike Chapter of the National Society Daughters of the American Revolution (DAR) as well as the Phil Ficarra Weber County Chapter of the DAR, The Ogden Kiwanis Club, and of course Post 9 Utah American Legion. This memorial is located in the Veterans Section of the Ogden City Cemetery and was sculpted by Gilbert P. Risvold, also known for his sculpture of WWI servicemen at the Oak Park and Forest Memorial in Chicago, which includes a doughboy statue similar to the one in Ogden. Among the repairs for the Ogden Doughboy Memorial are to fix a bent rifle barrel damaged in an apparent attempt to steal the replica weapon, shot gun and other small arms damage to the Doughboy's back, and replacement of the gun bolt and the original helmet that was stolen and replaced with an ordinary painted construction hard-hat. Through their effort, this group will be repairing this tough, abused but still standing Ogden Doughboy with the TLC and honor this representative of the fine WW1 veterans deserves. We are proud to have the Ogden Doughboy project submitted to our 100 Cities / 100 Memorials project. Many thanks to the Utah team for doing this important project. Bent barrel from an attempt to steal the replica Springfield riffle. ​Stood up to some target practice over the past century! Gun bolt needs to be replaced as well as the helmet. Please note that although this is a matching grant competition, based on our program rules, once you have submitted your grant application, we are able to help you promote it in a variety of ways including via the US World War One Centennial Commission website, posted project profiles, blog posts, social media posts, and our outreach communications vehicles. This can help you highlight your project in your communities and with local media, which in turn assists you with your fund raising and support expansion. With FIVE memorials to her tally.... Hunter Lori knocked one out of the park - or more accurately out of the stadium! Built in 1920 as a memorial to KU students who died in service during WW1. Located on the University of Kansas campus. Built by Native Americans to commemorate those of the Haskell community who served in WW1, many of whom were not citizens of the US. Stadium is falling into disrepair, unfortunately. Cultural museum across the street has quality exhibits about the heydays of the stadium, the military history of Haskell alum, and the rich history of Haskell Indian Nations University. Well worth a visit. Originally named Liberty Memorial High School, it was completed in 1923 as a monument to the Lawrence High School students and graduates whose died in service during World War I. Of the 300 Lawrence youth who served, 144 hadn't yet graduated from high school. This number includes the two high school girls who died while serving as nurses. Like the Memorial Stadium, the student union was built to memorialize University of Kansas. It is situated on Mount Oread, overlooking the stadium, and was completed in 1927. The 6th floor of the union has a small exhibit which includes photographs of the 129 KU men and women who died during their service in WW1. Originally located at the Douglas-Leavenworth county line, the victory eagle is now located on the University of Kansas campus. This bronze sculpture, cast in 1920, was a part of the Victory Highway project, which intended to place these sculpture at each county line of U.S 40. A plaque at each sculpture would list those from the county who had served during WW1. The Great Depression disrupted these plans, and only six victory eagles were ever installed. After being vandalized and toppled in the early 80s, the sculpture was moved from the county line to the university campus. The original plaque has been lost to history, as has the name of the artist and foundry. Check your local schools. Even if the building is newer, check the flag poles. Was your school's stadium built before 1930? Apparently is was very popular to dedicate them to WWI veterans groups. Are you at a state university? Check with the library, or the administration to see if there are any plaques, statues or stones they know are WWI memorials. Are your kids there? Ask them to check. Take a lesson from Hunter Lori. Check your schools, universities and stadiums! Memorial Hunters - You are AWESOME!! California was representing with THREE submissions... from Hollywood, Los Angeles and Glendale. There wonderful WWI memorials hidden around big metros. In fact, hiding in plain site is Los Angeles' huge traditional stadium, the Memorial Coliseum, former home of the Rams, Trojans, Raiders and site of TWO Olympics. This venue is actually a dedicated WWI Memorial site. Right after the war, Los Angeles was trying to get a large athletic complex built, so the idea was advanced to make a multi-purpose stadium that could hold sporting, civic, and memorial events. The stadium was dedicated as a perpetual memorial to LA County Veterans of the World War. I've lived in Los Angeles for 45 years and never knew! And small town American was also representing in force this first week with interesting WWI memorials, surprisingly often located on "Main Street". Uncovering these fading and even lost treasures is fun, educational and meaningful. It's a great weekend activity! As you pull together the information and background of these memorials, your community history comes into focus. And when we are done, dear Memorial Hunters... We will have a national register of these important remembrances to our past. Get in touch with local scout troops, Legionnaires, VFW, civic organizations, church groups, make it a school field trip. AND DON'T FORGET TO INCLUDE THAT SELFIE WITH YOUR FIND. If you are undertaking a 100 Cities / 100 Memorials project, you need to get permission from the controlling entities. This can include the building owners where the memorial is located, the city and perhaps even the state historical commission if the memorial is a recognized historical artifact. We have provided you with a sample letter you can adapt to your project as a resource support and aid for your use. 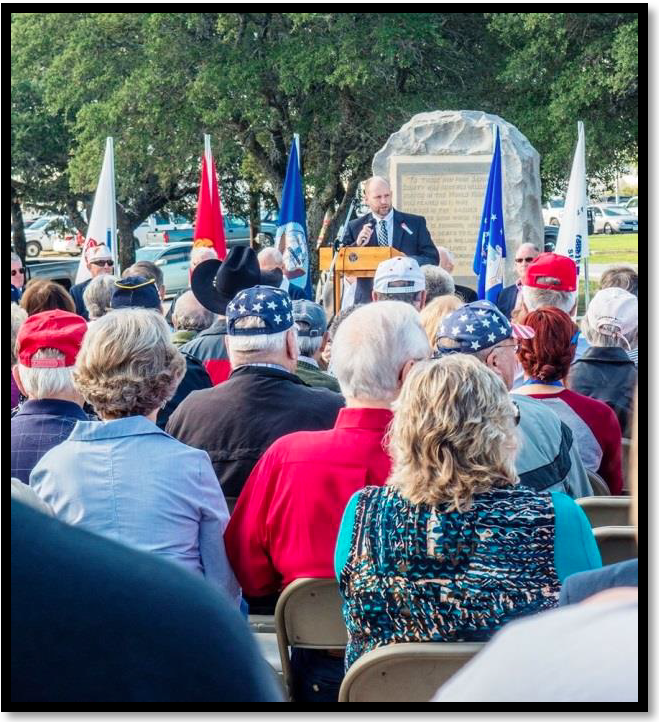 ​Richard Eckert from American Legion post 42 in Ocean Springs, MS led the charge on a memorial Restoration Project that provides us all with wonderful example of what a 100 Cities / 100 Memorials challenge grant project can look like. They completed their project earlier this year, and qualifies under the program. Because they have already submitted their application, we are able to profile it on the National site, which is a benefit to you, us and them. Check out this project profile and let us know what you think. The 100 Cities / 100 Memorials Competition Briefing Webinar is now available as a video. You can watch it here or in the new Resources section of the program's site. This interactive online event is for Veterans Service Organizations and anyone who want to participate in the 100 Cities - 100 Memorials matching grant challenge. FEATURED PROJECT PROFILE: American Legion Post 42 Ocean Springs PERSHING SQUARE PROJECT. Hear from an American Legion post that has produced a qualifying project and learn what they went through and some of the peripheral, and unexpected results. ​Three of our publishing partner states have created comprehensive resources of monuments, memorials, and historic WWI sites. This is really helpful for the 100 Cities / 100 Memorials program, supporting interested participants in finding local service projects in these states. We will be combining their databases with additional information we have been pulling together and we will be publishing a new 800+ location WWI memorial map in the next 10 days. When you see it, you will understand that we are far from a comprehensive compendium of WW1 Memorials. 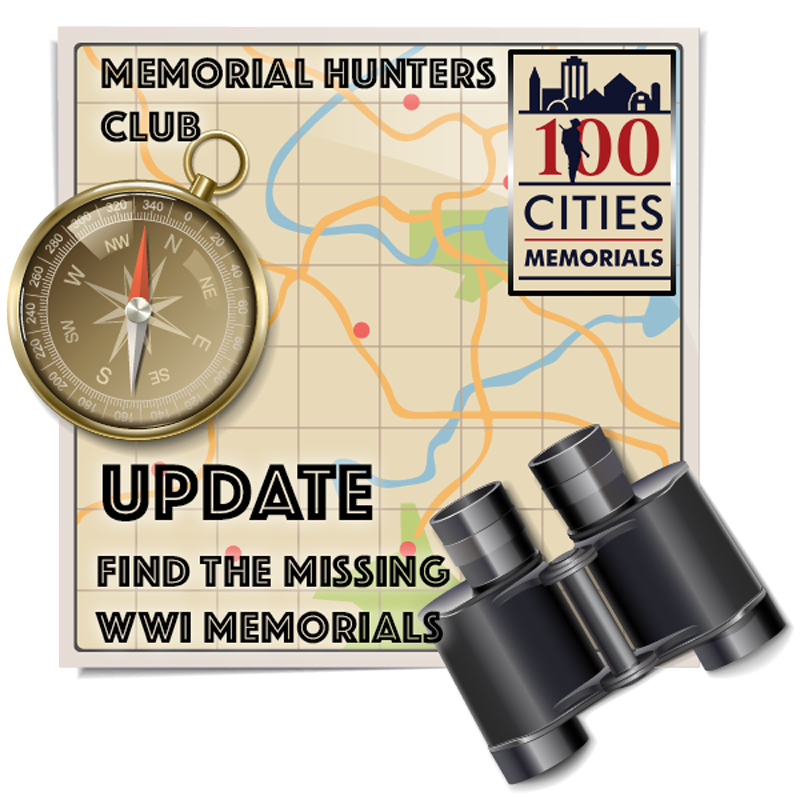 SO - stand by for an announcement about our upcoming MEMORIAL HUNTERS CLUB, where we will be encouraging interested parties to find and report local WWI memorials helping anyone who is interested in conserving or restoring this partially lost and hidden American history. This interactive online event is especially focused at Veterans Service Organizations who want to participate in the 100 Cities - 100 Memorials matching grant challenge. However, the information is pertinent to anyone interested in participating in the program. SPECIAL FEATURE- PROJECT PROFILE: American Legion Post 42 Ocean Springs PERSHING SQUARE PROJECT. Hear from an American Legion post that has produced a qualifying project and learn what they went through and some of the peripheral, and unexpected results. We will be hosting a special online event focused especially for Veterans Service Organizations who want to participate in the program - however the webinar will apply to everyone interested in participating in the 100 Cities / 100 Memorials matching grant program. We will be sending out more information including a registration link in the coming week - we just wanted you to save the date. The competition manual and the competition regulations have been updated to reflect the new project schedule. We recommend that prospective grant applicants read the updated competition manual, schedule and competition regulations either online or by downloading the PDF. Chris Isleib, The World War One Centennial Commission's Director of Public Affairs was interviewed by Defense News television about the 100 Cities / 100 Memorials project. The $200,000 matching grant giveaway program is being received with huge excitement everywhere. Veterans Service Organizations, civic groups and many others have contacted us with great enthusiasm for participating in the program. Along with the interest has come a very consistent concern about the short time available for participants to identify, plan, organize and submit projects for matching grant consideration. The consistent request for more time to ID and prep project submissions makes tremendous sense to the program sponsors. We are reworking the whole program schedule now, but our goal is to honor all the submissions over next summer and to announce the winning grantees on Veterans Day 2017, giving everyone a year to complete their projects. If you have any questions, you can submit them by clicking this link. 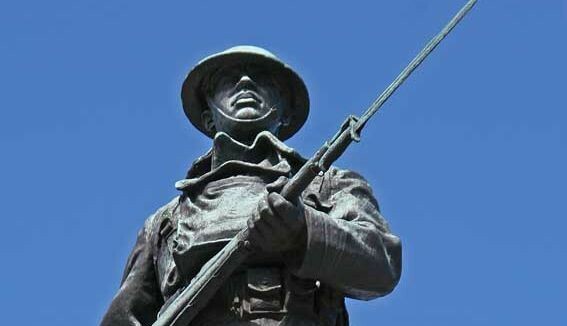 This is the first in a series of informational webinars for our $200,000 matching grant giveaway to restore ailing WWI memorials. 3. A guide on the do's and don'ts in restoration. The webinar will feature conservator experts and project team members to help you get going with your planning. PREFACE: This post is an expansion (and paraphrasing) from questions asked to Dr. Mark Levitch, an art historian at the National Gallery of Art, and the founder and president of the World War I Memorial Inventory Project. 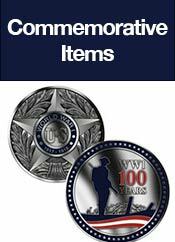 He has partnered with the U.S. World War One Centennial Commission on 100 Cities/100 Memorials. Q2: If a group wants to do a simple cleanup or update, what are the top "do" and "don't do" things they should be aware of? The most important thing to do is to leave any hands-on work to a professional conservator. Any attempt at "cleaning" a memorial—even a simple bronze plaque—can cause permanent damage. The American Institute for Conservation maintains a list of qualified object conservators. Non-professionals can focus on documenting a memorial photographically. You can pay special attention to problem areas, such as cracks in stone, graffiti, or discolored plaques and of course, it is always possible to put together a project that focuses on cleaning up or beautifying the area around the memorial, including landscaping, adding a place to site in contemplation, and things of that nature. We also nvite you to join us for our "Memorial Restoration 101" webinar scheduled for September 8, 2016 The webinar is designed for potential participants who want to learn more about what to do, how it should be done. It will feature conservator experts in these kinds of restorations. We will be publishing a sign up for that webinar next week. Q1: What is the best way for people to ID and find WWI memorials in their community? 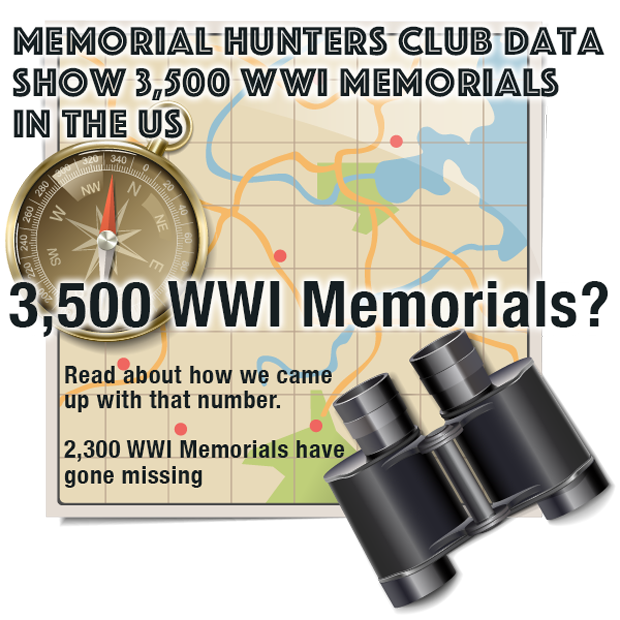 Some memorials can be found online, but many can't – and hunting them down is half the fun. Community memorials are frequently situated in central locations, such as town greens or squares, or along a main street or major intersection. They are often found, too, at courthouses and town or city halls. Other popular locations include parks (especially memorial or veterans parks), American Legion or VFW posts, cemeteries, and schools and colleges. 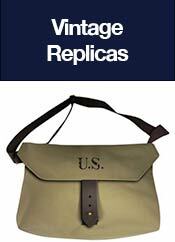 Churches and synagogues also frequently erected honor rolls, as did many large businesses and institutions. 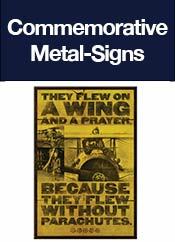 World War I also ushered in "living," or functional, memorials—memorial stadiums, libraries, bridges, etc.—virtually all of which contain memorial plaques. Dr. Mark Levitch, an art historian at the National Gallery of Art, is the founder and president of the World War I Memorial Inventory Project. He has partnered with the U.S. World War One Centennial Commission on 100 Cities/100 Memorials. PROJECT PROFILE: This article talking about the Rutherford WWI Monument is a great example of how a restoration project can tie a community rediscover its past and how you can leverage a phase of your project into the 100 Cities / 100 Memorials program as a submission. The time capsule placed under Rutherford's World War I Monument could be cracked open and be part of a special exhibit next year. The World War I Monument Committee is working with the historic preservation committee and may enlist the help of Bruno Associates to obtain grants for Phase 2 of the World War I Monument renovations and the time capsule removal, officials said last week. World War I resulted in such a large number of casualties that when it was over it was believed to be "The War to End All Wars." 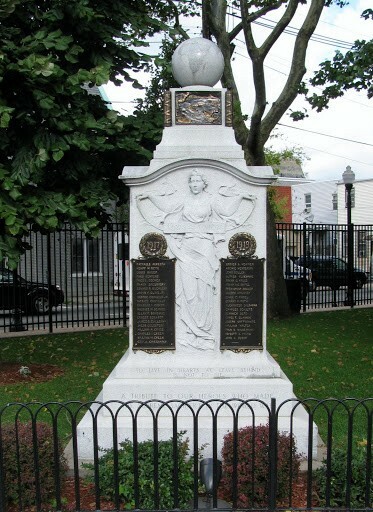 Rutherford's monument, originally called "The Soldiers' and Sailors' Monument," honors 19 sons of Rutherford who sacrificed their lives for their country during World War I.
Edgar Williams, the architect brother of the Pulitzer Prize-winning poet William Carlos Williams, designed and built Rutherford's World War I Monument in May of 1920. The architect, who died in 1974, had a strong influence on the civic heart of the borough and felt that the boys lost to the war should be honored in a monumental way-an ever-burning torch in the middle of Rutherford's downtown. A bronze plaque on the pedestal bears the names of the 19 Rutherfordians who died in the war along with 19 stars to represent each one. Also listed are the battle locations in which Rutherford soldiers fought: Somme, Cantigny, Marne, Cambrai, Chateau-Thierry, Mount Kemmel, St. Mihiel, Meuse-Argonne and Piave. At the July 25 mayor and council meeting, the mayor reappointed Bill Galloway, Virginia Marass, Teddy Van Winkle and Rod Leith to the WWI Committee. The mayor said he intends to appoint other members at a later date. In addition, a resolution passed allowing for the appropriation of $1,040 from a 2015 Bergen County Historical Grant. Mayor Joe DeSalvo said the WWI Monument Committee will work with the historic preservation committee and Bruno and Associates to obtain grants. The mayor and council recently awarded a $9,500 consultant contract to Architectural Preservation Studio PC (APS). APS is preparing a bid solicitation for the work on the next phase of repairs and restoration on the WWI Monument, with Sandeep Sikka as the lead APS partner on the project and a maximum budget of about $89,000. 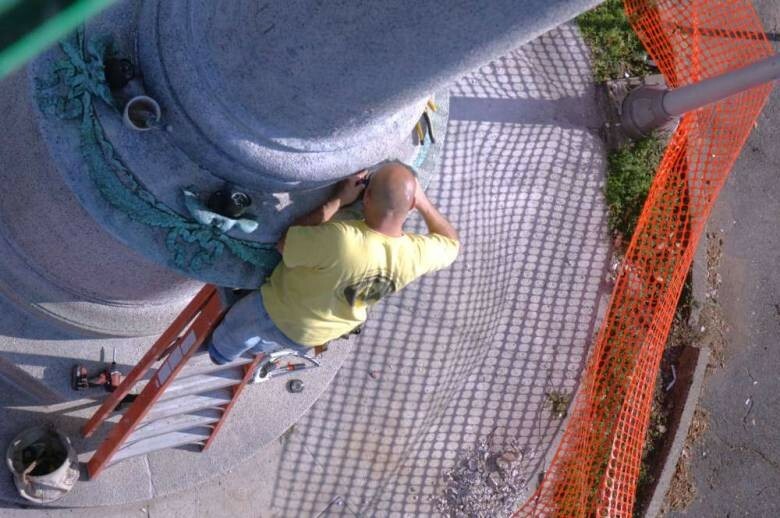 The scope of Phase 2 is to address drainage repairs, safety buffers for the immediate circle around the monument and restoration work on the monument's bronze ornamentation. The scope of work also includes applying water repellant to the monument surface to keep it from suffering further water-related deterioration, said Borough Historian Rod Leith. Leith is also hoping that funds will be left over for salvage and preservation of the time capsule and its contents, which have been under the monument since 1920. 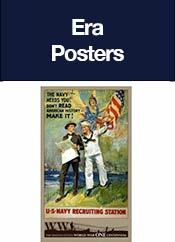 The items would make up a special exhibit in 2017 and 2018 that would coincide with the anniversary of the entry of America into WWI and the peace treaty signed in 1918. The Rutherford Historical Committee plans to apply to the Pritzker Military Museum and Library for a grant of $2,000 with the 100 Cities/100 Memorials Grant Program. The grant would have to be matched by the town. Rutherford would apply and use the money-a total of $4,000-to offset the cost of hiring a conservator for the WWI time capsule consulting work, said Leith. The American Legion's national organization has passed an executive committee resolution to support the 100 Cities / 100 Memorials project. 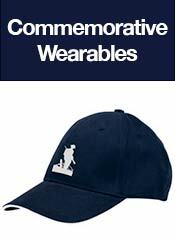 The Legion itself was formed as a result of World War One was often directly involved in the creation of the WWI Memorials erected in the years following the War to End All Wars. The 100 Cities / 100 Memorials program is looking forward to working with local posts around the country as the program's local representative to help communities find, define and address memorial restoration opportunities. 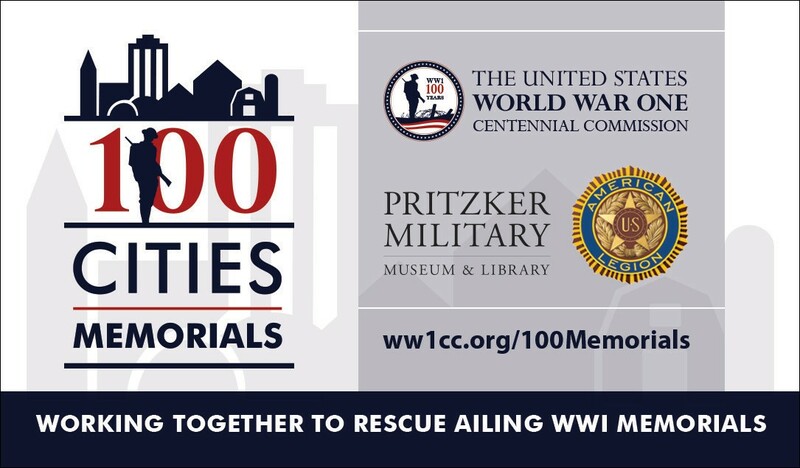 In a program launched in July, 2016 The U.S. World War I Centennial Commission and the Pritzker Military Museum and Library have announced a $200,000 matching grant challenge offering awards for up to 100 local projects around the country. To get one of the matching grants, applicants need to A) identify local World War I memorials; B) put together a proposal for their memorial in distress; C) submit their project for consideration; D) raise local funds for a match of up to $2,000 per project. The "100 CITIES / 100 MEMORIALS" program is particularly well-suited for community-service projects hosted by veteran group posts, historical/cultural/community organizations, faith groups, school programs, scout troops, local sports teams, and motivated citizens. "The program is designed to foster a sense of heritage in local communities and to recognize local stories & people who were involved in the war. This $200,000 initiative also creates a way for community members to participate in the national World War I Centennial that begins in 2017". To qualify for a matching grant, a project proposal needs to be submitted by November 11, 2016. Memorials need to be located in the 50 states or US territories, and the preservation work must be completed (or have been completed) between January 1, 2014 and November 11, 2018. This veteran honoring program has been endorsed and adopted via a national executive resolution of the American Legion, who itself was formed right after WWI.